M’Finda Kalunga Community Garden is a kind of “communal backyard” for those who live and work in the area. By volunteering to participate as gardeners, we express a shared interest and commitment to gardening, as well as acknowledging that we are also here to maintain the garden as a community green space. In exchange for this small patch of nature, we’ve agreed to be active participants in the maintenance and growth of this valuable community resource. Members have responsibilities which, when shared equally among all of us, are not time consuming or difficult. All of our hard work and efforts do not go unnoticed. The numbers of visitors who walk through the gates and stare admiringly at the lush landscape, enjoy the solitude of a secluded bench, as well as the children who leave the sandbox looking like little breaded cutlets are living examples of the fruits (and flowers!) of our labor here in the garden. Research/history by Emilyn L. Brown. The M’Finda Kalunga Garden means “Garden at the Edge of the Other Side of the World” in the Kikongo language. It is named in memory of the “second” African American burial ground that was located on nearby Chrystie Street between Rivington and Stanton Streets. Dutch colonists forcibly brought the first Africans to the New Amsterdam colony in the late 1500’s. By 1748 African Americans, enslaved and free, made up 20% of the city’s residents. New Yorkers of African decent endured mistreatment as well as the indignities of curfews, meeting prohibitions, and burial restrictions. They were banned from membership in churches, at best relegated to balconies and back pews as in nearby St. Augustine’s Church. In 1794, the African burial ground near City Hall was closed and by October of that year the Common Council of New York City received a “petition from the Sunday Black men of this city praying the aid of this board in purchasing a piece of ground for the internment of their dead”. By April, the land was granted in what was deemed “a proper place”, near the dilapidated ruin of James de Lancey’s mansion, bound to the east by First Street (now Chrystie). The cemetery existed at the site of 195 Chrystie Street and partially beneath The New Museum of Contemporary Art on the Bowery. Some remains were found during the excavation of the Museum. We hope to raise both awareness and a prominent marker to honor the existence of the Burial Grounds. 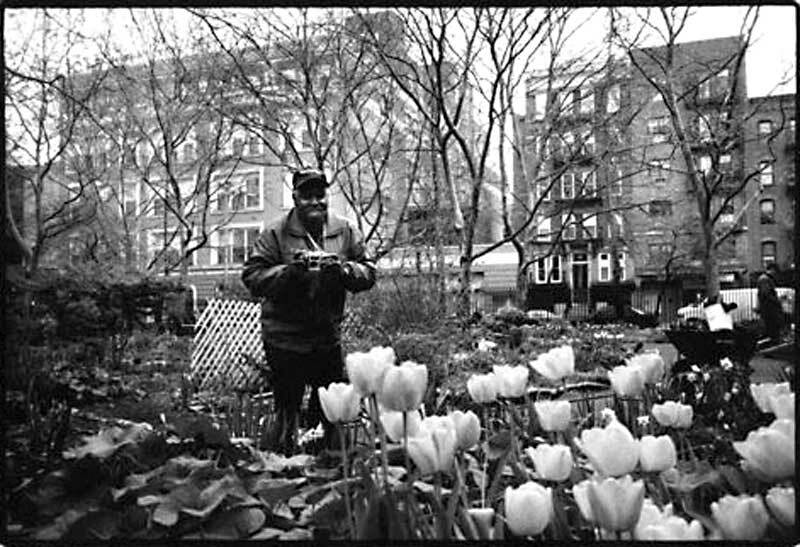 The M’Finda Kalunga Community Garden was founded in 1983, as a project of the Roosevelt Park Community Coalition. The coalition formed in 1982 to address the area’s lack of affordable housing and overwhelming drug problem and to encourage the community to build on and create new resources within the neighborhood. The organizers viewed their work as a beachhead from which to launch initiatives that would make the community a better place to live: a recreation of that same «stabilizing force in the community». We continue in that vein. Up to 50 regular gardeners including community groups maintain individual beds, and contribute to the upkeep of communal areas. There are cultural festivals, children’s and senior’s gardening programs, read-alouds, movie nights, clean up and planting days, housing roundtables, peace marches and other events. Keys and individual plots are earned on an apprenticeship basis as they became available. Would-be members work with current members on shared plots and demonstrate their commitment to the Garden’s mission “To protect and improve the community for the people who live and work here”. Quotes from ”Chrystie Street Cemetery” by Emilyn L.Brown UPDATE, Vol. 1 No.9.